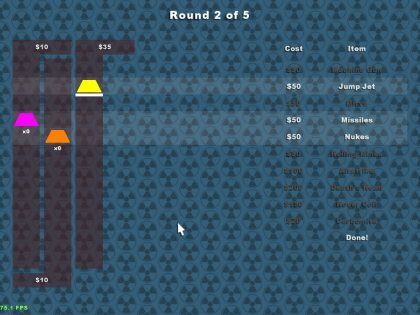 The top part of this menu allows you to change the layouts for the two players who can use the keyboard. These layouts are named 'Keyboard 1' and 'Keyboard 2'. Below this, is a list of all the joysticks currently connected to your computer. 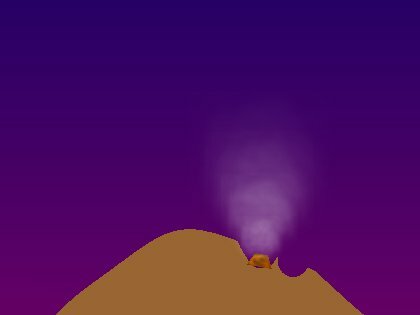 Groundfire can support up to 8 joysticks. If you have more than this, they will not appear in this menu. Each available joystick can be assigned one of eight layouts. Each layout can have a different set of mappings between the joystick controls and the game commands. Clicking the arrows next to the layout name will change the layout assigned to each joystick. 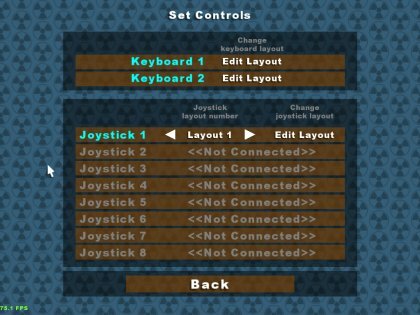 You can assign any layout to any joystick. If you have several joysticks of the same kind, it might be convenient to give them all the same layout and alter that layout once only. 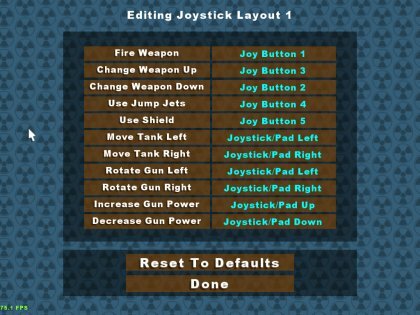 The 'Edit layout' buttons next to each keyboard and joystick entry will take you to the 'Editing layout' menu for the layout currently selected for the joystick or keyboard. From here you can change any of the control mapping for a layout. This screen is practically identical whether you're editing a keyboard layout or a joystick layout. The menu lists all the game commands on the left and the current control mapped to each command on the right. To change any control mapping, click on the name of a command and push the desired button or axis direction on the joystick (or press a key on the keyboard). One thing to be aware of is that it is currently possible to map a control to more than one command. Once all the control mappings for a layout have been set as desired, clicking 'Done' will automatically save the new layout mappings. Pressing 'Reset To Defaults' will revert all mappings to their defaults. Selecting 'Start Game' from the main menu takes you to the 'Select Players' screen. Before the game can start, at least two players must join the game. A player joins by pressing the 'Fire' command on a joystick or the keyboard (see 'Setting up the Controls' for how to configure this command). 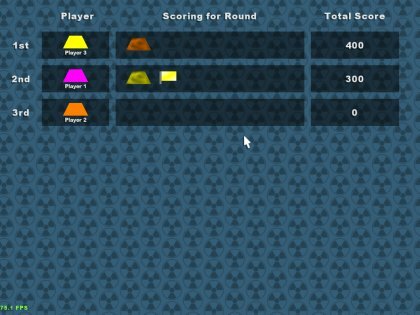 Each player who joins is assigned a tank with a unique colour. Once two or more players have joined, the Start button becomes available. Before pressing this, the number of rounds to be played can be set. Anything between 5 and 50, in increments of 5, is possible. The small tank picture tells you who's status panel this is. The top bar shows the health of this tank, it gets shorter, the more health is lost. The second bar shows the amount of jumpjet fuel available to this tank in the current round. This bar gets shorter the more fuel is used up. The small circle next to the picture of the tank, shows the currently selected weapon. The one shown here is the normal 'shell' weapon. To the right of this, would be the amount of ammo remaining for this weapon. However, the standard weapon has infinite ammo so this is not shown. Once a shell is fired, the arrow turns red for a few seconds. Another shot cannot be fired until the arrow turns green again. This is called the 'cooldown' time of the weapon. (Hint: use the cooldown time to correct the angle/power of the gun to hit an opponent's tank). Shells will explode when they hit something. If they hit a tank or they explode near enough to a tank, they will cause damage to that tank. The health bar on the tank's status bar will show how much health remains for that tank. While on the ground, a tank can move slowly left and right using the tank left/right commands. 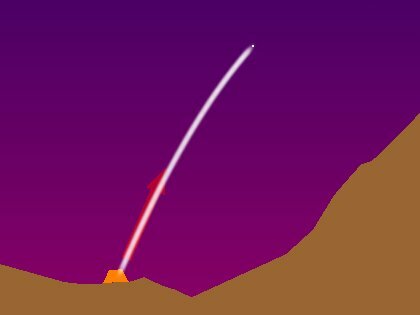 This is useful to avoid enemy shells and to make it harder for your opponents to hit you. Tanks can only climb slopes slowly and if they are over a certain steepness, they cannot be climbed at all. Jumpjets are not available until purchased from the shop. To use jumpjets hold the jumpjet button. The tank will lift off the ground. Tank's can be steered in mid-air using the tank left/right commands. Fuel is used up all the while the jumpjet button is helded down. Once another weapon has been purchased, a player can select a weapon by using the weapon up/down command. The icon in the status panel shows which weapon is currently selected, as well as the remaining ammunition. When switching weapons, you must wait for the cooldown time for that weapon before you can fire. Missiles can be purchased in sets of 5 from the shop. Missiles are guided. They are launched like the normal shells but, once launched, can be steered using the gun left/right commands. It takes practice to control missiles properly. Nukes behave exactly like the standard shell weapon but are much more powerful. Nukes do more damage and have a large blast radius when they explode. Nukes are purchased one at a time from the shop. A tank wins a round by being the last tank alive. However, it is more important to destroy as many other tanks as possible. This is where the majority of the scoring comes from. Each player appears on the table in order of total score. The middle column of the table shows which tanks were killed by which player in the previous round. A coloured flag signifies that the leader was killed (the flag colour is the same as the leader's). Killing the leader is worth double points. Extra points are awarded for winning the round (not dying). There is a columns on the left for each tank. The list on the right shows all the weapons available for purchase along with their price. The players can move their tank icon down or up a row using the gun up/down command. 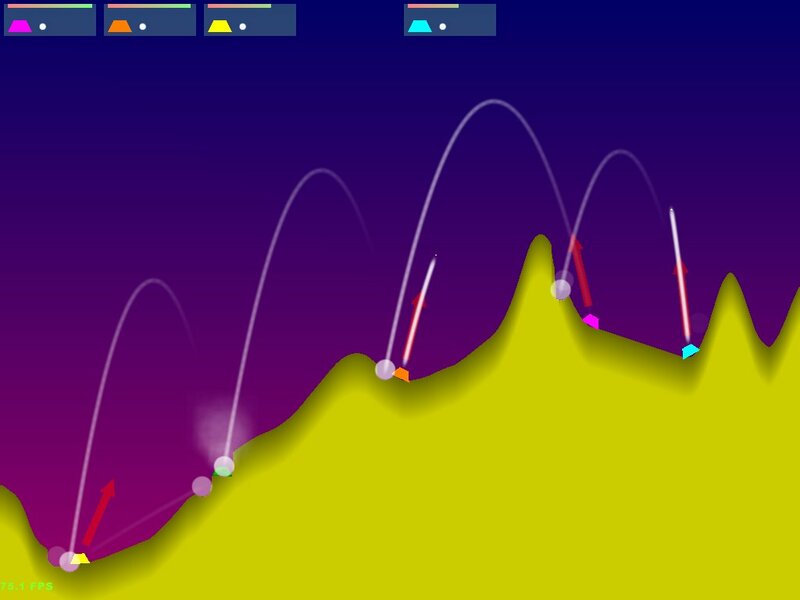 To purchase a weapon, a player presses the 'Fire' command. After each player has done all their shopping, they can go to the 'Done!' row at the bottom to exit the shop.